Moses H. Cone Memorial Hospital | TROX USA Inc. The construction of the North Tower at Moses H. Cone Memorial Hospital in Greensboro, NC is the largest expansion by Cone Health featuring 16 modern operating rooms and 96 private patient rooms, among others. Designed by Charlotte (NC) based Perkins+Will, this $200 million project is six stories high and more than 260,000 square-feet big and opened recently in June 2013. The hospital is seeking LEED® silver certification with its sustainable design and will be among an elite group of hospitals to achieve this status. After completion 83,000 square-feet of existing space will be renovated and will be completed in 2015. 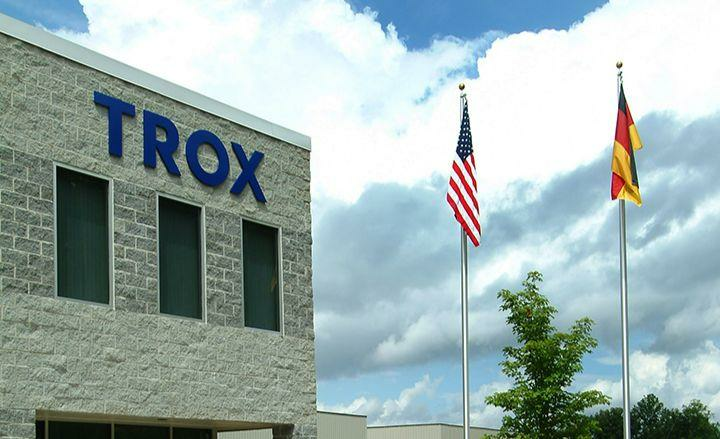 In this project, TROX USA provided Active Chilled Beams type DID604 and DID632. With this installation the Moses H. Cone Memorial Hospital is the first healthcare facility in North Carolina and one of only three hospitals in the United State to use chilled beams. The chilled beam system is very energy efficient, reduces large ductwork and plant room and AHU sizes. Due to no moving parts it is also much more quiet than a traditional cooling system. According to a 2016 article in Consulting Specifying Engineer magazine, the North Tower expansion, 2 years following occupancy, has had several "major successes", which include a "reduction in historical infection rates (which were already very low) and a significant decrease in patients' temperature complaints." The article continued to explain the "improved energy efficiency by using a new certified energy procurement professional (CEP), active chilled beams, solar hot-water heating, etc., the heating and cooling energy consumed by the facility actually went down despite adding 225,000 sq ft of conditioned space."